As the Arctic ice continues to fade away, some scientists have come up with radical solutions to the problem of greenhouse gases. One of these ideas is large-scale Carbon Capture and Storage (CSS), burying those troublesome gases underground — but now it looks like that notion could cause more trouble than it's worth. Mike Orcutt of Technology Review alerts us to a new paper in the Proceedings of the National Academy of Sciences which argues that CSS won't work — because it could trigger earthquakes, allowing the trapped greenhouse gasses to escape. The paper, authored by Stanford researchers Mark Zoback and Steven Gorelick, is a heavy blow to those who are hoping to see CSS become a major player in climate control. Carbon sequestration works by transporting and pumping the CO2 emitted by various industries into underground geologic formations. The idea is to securely store it away from the atmosphere, a potential way of mitigating its contribution to global warming. But now it appears this isn't such a good idea — at least when it's done on a large scale. In his TR article, Orcutt notes that the oil and gas industry already uses techniques that are similar to CCS during resource extraction and wastewater disposal — and these techniques are known to cause small earthquakes. This practice has resulted in earthquakes in Arkansas, Ohio, and near the border of Colorado and New Mexico. The authors of the PNAS paper say that the risks can be managed through careful site selection, but that large-scale operations are more problematic. The challenge, they say, is finding a place that can keep a "buoyant fluid" in place for hundreds of thousands of years. The most promising storage containers are called deep saline aquifers-rock formations one to three kilometers underground, below the depth of freshwater aquifers, and beneath a layer of impermeable rock called the caprock, which acts as a seal. A modeling study by MIT researchers, published earlier this year in PNAS, estimated that deep saline aquifers in the United States could hold at least a century's worth of the carbon dioxide produced by the nation's coal-fired power plants. He has more to say about the issue over at Technology Review, so be sure to check it out. You can also read the Zoback and Gorelick paper in its entirety. 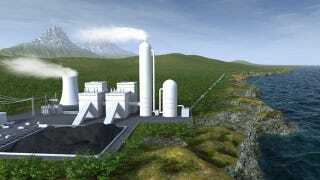 Image of proposed carbon capture facility via Bellona. Inset image via Technology Review.